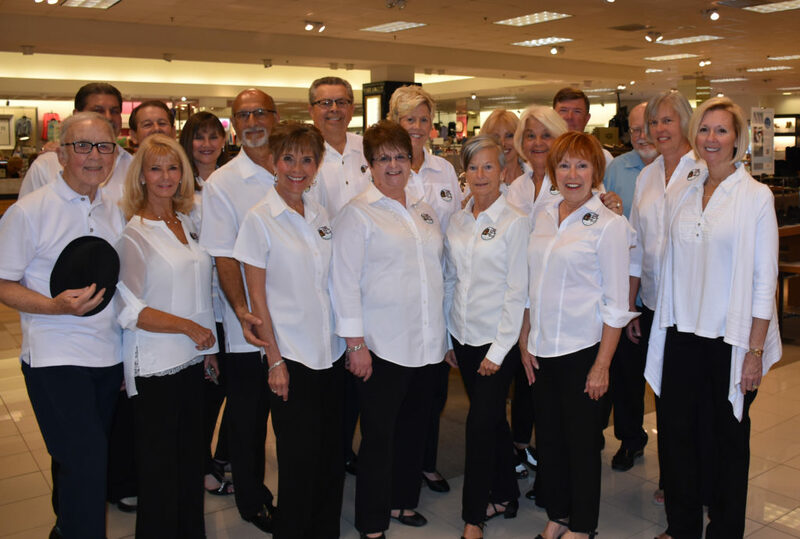 Once again, the OD Shag Club Dance Team was invited to Belk’s Shoes and Accessories Day at Belk’s in Myrtle Beach Colonial Mall. Thank you, Cindy Day, as our point of contact and for setting up this event. The Department manager Kerry gave us a warm welcome and invited us to dance for this event. We had great participation by our Dance Team. The team normally dances for about 40 minutes. Each dancer dances a spot line dance for approximately a minute and a half. However, we were asked to dance a second set, since the customers of the store were very interested in the Shag Dance. We danced from 1PM until 3 PM and enjoyed every minute. Belk’s gave away several door prizes for all those who what to participate and they always treat us with a token of their appreciation. The ODSC March party was a chili cookoff and there was lots of great chili to be consumed. There were 23 participants who provided the great food for all of us. A great variety of chili was made which should have provided everyone with something to fit their individual taste. Many thanks to all participants and congratulations to the winners. Our Entertainment Committee Chair, Kathy McCoy, had an event focused on getting people on the dance floor. The more you danced, the more Mardi Gras beads you collected. At the end of the night, the person with the most beads won a $25 gift certificate provided by Fat Harold’s. Maxine Presley stayed on the dance floor almost continuously and at the end had 39 strands of beads. Congratulations, Maxine! Other winners for the night included Sheila Wright who won $20 for wearing her name tag. Kathy McCoy won $20 for having on ODSC logo wear. The 50/50 winner received $250. Margie Payne, a guest from Maryland, had the winning ticket. On a final note, it is important that we remember to thank all of those that work at every party so we can have all of this fun. When you see the members of the Hospitality, Food, Membership, Ways & Means and any other committee that is working at a party, please thank them for all their hard work and maybe sign up to help so they can have a little time to have some fun. Until my next voluntold event write-up, remember to keep dancing! 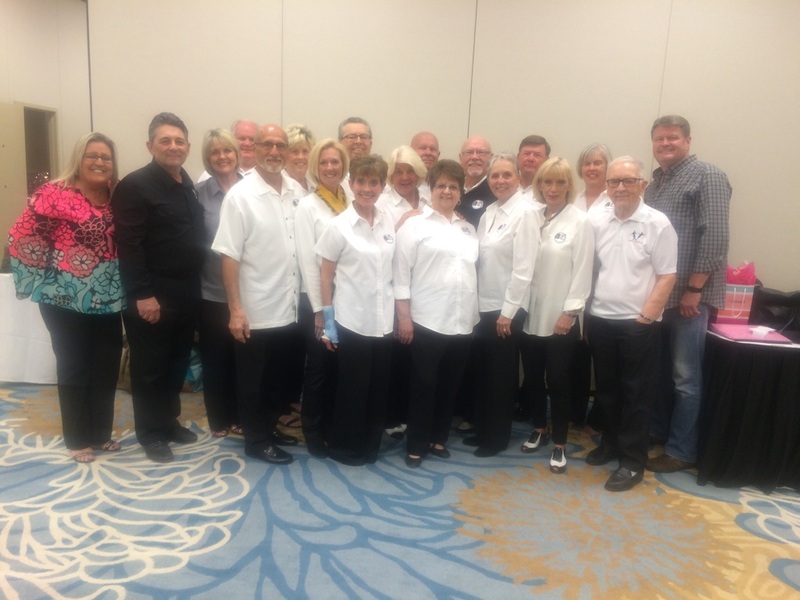 The OD Shag Club was invited to dance at the Agricultural Business Meeting/Conference located at the Double Tree Resort in Myrtle Beach March 11, 2017 at 7:30PM to 10PM at the request of Lisa Caveny ACSC Secretary. Lisa asked the Team to demonstrate the Shag Dance along with teaching a line dance. Al and Patty Guazzo from South Strand Shag Club taught the basic Shag Steps. After Lisa educated the group on the history of the Shag, she introduced Al and Patty and the OD Shag Club. At that we were ready to dance. We had a great dance floor and great DJ from Murrell’s Inlet Paul Matthews playing great music to dance to. Al and Patty did a great job teaching the basic. Men on the right, ladies on the left. Each member of the dance team paired off with members of the conference. The students were hungry for instructions: 1 and 2, 3 and 4, 5 6. Even though not one of their group knew how to Shag, by the end of the instruction, everyone was on the floor dancing to the music. All but a couple of their 50 members were on the floor. This was a very enthusiastic group. We all had a great time and grateful that we could promote the Shag Dance. Their group was very pleased from the comments heard during the night. A special thank you to Lisa Caveny for setting up this event and the opportunity for the OD Shag Club Dance Team to perform, Dwayne Baggett, SOS Board Member and Dale Phillips, from the Electric City Shag Club. On March 11th, I was invited to organize shag lessons for a convention of Federal employees representing the US Department of Agriculture. The desire to learn about our state dance was expressed and all in attendance were South Carolina residents. I posted a request on Facebook for volunteers to help with this opportunity. The first to respond was Allen and Patty Guazzo from South Strand Shag Club, Murrells Inlet. Allan and Patty are local to the south end of the Grand Strand and teach shag on a regular basis as part of their passion for our dance. I then heard from Lou Martino and Linda Campbell, who coordinate the appearances of the OD Shag Club Dance Team from North Myrtle Beach. Lou lined up about a dozen or so faithful volunteers who regularly go out into the community and share the love of our dance. I now had my instructors and an entire dance team!! My desire to volunteer and share our dance just became strengthened by the generous spirit of these fellow shaggers. The others to reply quickly to my plea for help were SOS Board Member and friend, Dwayne Baggett and my boyfriend Dale Phillips representing Electric City Shag Club, Anderson. I composed a short bit about the history of shag and off we went to Myrtle Beach. The evening was held at the Hilton Doubletree Resort in Myrtle Beach and there were approximately 40 in attendance. Our DJ for the evening was Paul Matthews of Music on the Strand, Myrtle Beach. After a brief introduction and history of the beginnings of our dance, The OD Dance team, dressed so nice in their starched white shirts and black pants, came to the floor for two exhibition style dances. They danced to Cake On The Ocean by DNCE and Silk On Glass by Vance Kennedy. The low to the floor shuffle steps were easy to see by the audience and there were quite a few turns and fancy steps spotted. Lou did such a nice job of changing partners for the second dance to ensure that all members of his team had time on the dance floor. The love of our dance was evidenced by the fun and the high energy that this dance team displayed. Next we called to the floor Al and Patty, who broke down the basic shag step to a packed dance floor. Al asked the audience, “How many of you know how to walk?” (All hands reached high up in the air) He replied, “Then shagging should not be difficult because shagging is like walking to the beat of music.” After demonstration, slow methodical instruction, and plenty of repetition…it seemed that everyone was catching on. “One and two, three and four, rock step” was counted aloud and every person was shagging! The smiles were contagious and you could see that everyone dancing had just taken their first steps into our wonderful world of beach music and shag dancing. I was so very proud of how this event came together…unrehearsed, many volunteers I met for the first time, two local shag clubs bringing their talents and energy to one dance floor…It was such a success! The comradery and support that I felt from each person who volunteered their time was over whelming. I don’t know that there are words to describe exactly how I felt as I watched Al and Patty and their patience through instruction, Al added just enough humor to keep everyone from getting discouraged, the friendliness and encouraging nature of the OD Dance Team members as they took these beginners by the hand and made certain that every person on the floor had a partner, and last by not least, the support and willingness to attend and participate by Dwayne and Dale, who offered me encouragement throughout the entire planning process. Sometimes things have a way of just working out…and sometimes it goes beyond your expectations…this was one of those times. God bless each shagger who participated…I appreciate you! Each one of you personify the entire reason that I choose to serve. May you always dance like everybody’s watching!! The support of the OD Shag Club was out in full force for the St. Patrick’s Day Parade held on Saturday, March 11th. The weather was great, and everyone including golf carts were decked out in their St. Patrick’s Day attire. 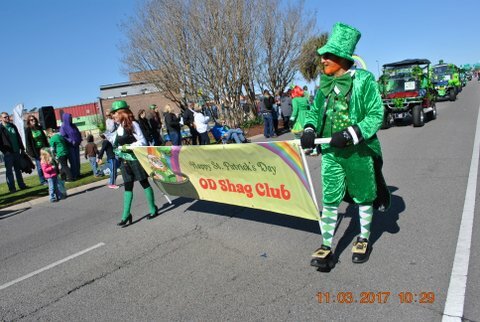 Our parade chairman, Billy Powell reported that 78 members and guests participated and a total of 21 golf carts paraded down Main Street in representation of the OD Shag Club. He also reported that the troop threw out 12,240 strands of beads, but best of all the Club won 1st place in the Non-Profit Division. Thank you, Billy Powell, and your group for another successful parade. The Oyster Roast was a great success. We had a great turn out of our members and their guests. The food was plentiful thanks to Donnie Schultz and the food committee. His team of cooks do works hard to have this event go smoothly and making everyone happy. There was never a shortage of oysters. The tables were set up in a manner that Dickie Garrington high on his 10-foot ladder could see the whole club while directing the oyster handlers where the next batch of oysters should go. Once again, the month of March is going to be very busy. Starting with the Beginners 2 class which will start Thursday, March 2, 2017, at 6PM in the backroom of Fat Harold’s and will continue each Thursday ending March 30, 2017. Our monthly meeting will take place on March 7, 2017 at 6PM in the backroom of Fat Harold’s all members of the OD Shag Club are welcome to attend. The big Saint Patrick’s Day Parade will be on March 11, 2017 we plan to have all of our golf carts in a row. So, dress up in your GREEN and come and enjoy the day. The lineup for the parade will be begin at 7:30AM. March 11, 2017, will also start selling golf cart tickets on this day. March 14, 2017 is our monthly SASS class at 6PM in the back room of Fat Harold’s Terry and Kathy McCoy will be the instructors. And finally, on March 18, 2017, we will have our Chili Cook Off at 6PM in the back room of Fat Harold’s. The winner of the Oyster Roast 50/50 was Tim Webb. It was one of the bigger amounts that we have had in the past. Also thanks to Bill Anderson for entertaining us with some fine shag music.